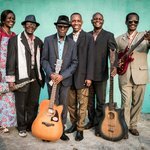 Bakolo Music International represents the pioneers of the golden age of Congolese rumba. 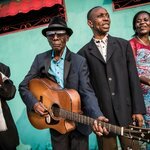 Singer, guitarist and grand survivor Nzofu Moko Buele, known to all as Bikunda, is carrying on a torch first lit in 1948 by ‘Papa’ Wend Kolosoy, the ‘father of Congolese Rumba’ and composer of the first Rumba hit song, ‘Marie-Louise’. The young Bikunda was in the first line-up of Wendo’s band that remained highly influential over the next decades until the mid-60s when Wendo retired after falling out with the Mobuto regime. 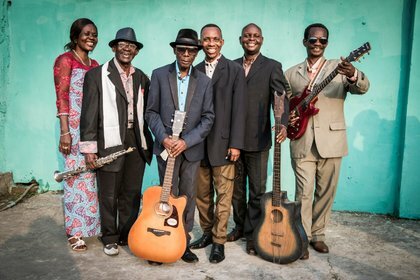 In 1997, Wendo returned, reuniting with Bikunda and several other original members, and went on to tour the world, as documented in the highly-acclaimed film, On the Rumba River. After Wendo’s death in 2008, Bikunda determined to carry on his legacy as long as he can. The rumba river rolls on.